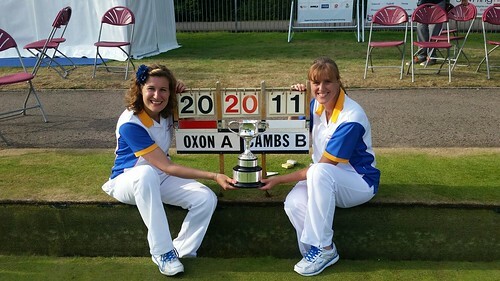 Congratulations to Donna and Katherine on winning the National Pairs. After some close finishes in the early rounds and the semi-final they won the final 20 shots to 11. Chris Lewis and David Wedge unfortunately lost in the quarter finals of the Senior Pairs. Congratulations to Othman Sharif on winning the Longford Cup. Omar beat Brian Bloomfield in a thriller, With the scores level at 8-8 each after 11 ends, Omar scored on the next five ends to open up an eight-shot lead. His opponent fought hard but was unable to get any closer than four shots before Omar finished the game with a single on the 25th end for a 21-16 victory and condemn Brian to another runners-up position. I was pleased that so many of you turned out for my President's day. I invited rinks from Banbury Central, Kidlington, Kingston Bagpuiize, Watlington and Witney Town. Together with other club members it made a match of eight rinks. My team won but on the day I think it was the game of bowls that was the winner. We had a very good meal provided by Jenny and her team. The spider was won by Margaret Stacey and with the raffle we raised £ 230.00 for Macmillan Cancer Support. I must thank my wife Liz for all her hard work during the day and for her support during the season so far. Due to certain circumstances these will now be run from Friday to Monday 4th to 7th September. Good luck to all finalists. Please come along and support the finals. As you are all aware we are hosting the above event on 12th and 13th September 2015. Please come along to support these young bowlers. There is also a club night on Saturday 12th September with a BBQ and entertainment all for £ 6.00 per person, put your name down now to help with the catering. We will be welcoming a side from Bedfordshire. This is an 11 triples match. At the moment we are a few players short. Please put your name down if you can. Don't forget to put your name down for the last game of the season. With a meal and prize giving afterwards. This is traditionally a fun day to finish the outdoor season. Details of the menu are on the match notice board.